Fourth-graders from Bridgeway, Rose Acres and Willow Brook elementary schools took part in safety training on Oct. 19 through the annual Safety Day organized and sponsored by Bunge North America. Held at Rose Acres, the program was a full-day event designed for students to learn safety and health lessons they can use every day while at home or school and in the community. Guest speaker Tom Thelen kicked off the day with a motivational anti-bullying presentation. Thelen is the founder of the Victimproof Bullying Prevention Program and author of the book "Victimproof." After the opening presentation, students rotated through several different stations to participate in interactive activities designed to reinforce the importance of taking responsibility of their own safety. St. Louis Children's Hospital sponsored a bike helmet fitting, with Bunge volunteers demonstrating with a watermelon drop why head protection is needed. Missouri One Call was on hand to discuss underground utility safety and why it's important to call them before digging in yards. The American Red Cross presented information on emergency preparedness. 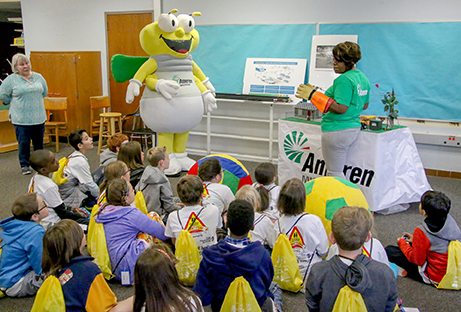 Ameren Electrical City shared information on electrical safety. Students from Pattonville High School joined with Bunge volunteers to host a station on sustainability, and Bunge volunteers led booths related to water and sun safety, stranger and internet safety and health and wellness. Dozens of volunteers from sponsor Bunge North America, an agribusiness and food-processing corporation, were on hand to assist the students during Safety Day. Also on hand were Bunge president Todd Bastean, vice president Gregory Billhartz and other executive staff. Pattonville’s school-business partnership office worked with the schools, Bunge and its co-sponsors to arrange the day. View a photo gallery from Safety Day. Representatives from Ameren shared information on electrical safety.